Acid reflux is a digestive condition where the stomach acids flow back into the esophagus (the gullet or tube which connects the stomach to the throat). It causes a burning sensation as well as pain in the abdomen and chest. At the end of the esophagus, the lower esophageal sphincter is found and functions as a valve which prevents the stomach acids from travelling upwards. If this valve is weak, the stomach contains too much food or gastric juices, or there is too much pressure on or in the stomach, acid reflux may occur. Factors that may also contribute to acid reflux include eating large meals, certain foods and beverages such as fatty, spicy foods, coffee, tomatoes, oranges, coffee, milk and alcohol. Lying down too soon after a meal, bending or lifting heavy objects may also bring about acid reflux. Being overweight, pregnancy, hiatus hernia and constipation can also cause acid reflux as increased pressure on the stomach pushes gastric juices back into the esophagus. A lot can be done to support soothed digestion and harmony in the stomach. Eating smaller, more frequent meals throughout the day can help to aid digestion. Food selection is crucial – as some foods (such as most condiments, spicy foods and junk foods) can contribute to common burning sensations in the stomach and esophagus. Eating before bedtime can also prove problematic, as gravity is then working against the stomach and may cause common acid reflux. Maintaining a healthy weight and wearing loose fitting clothes can also help your digestive system to function properly. Relaxation is key – activities like yoga and meditation can help to soothe the nerves and support calm digestion. Natural remedies can also help to support the nervous system and to keep nerves settled and soothed – to enable us to digest our foods properly and with little discomfort, supporting the healthy functioning of the stomach, and digestive system in general. 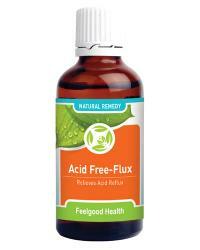 Acid Free-Flux a 100% natural homeopathic remedy that addresses heartburn and acid reflux quickly after meals. This remedy contains a selection of homeopathic remedies known for their ability to soothe and combat acidity in the stomach and esophagus. Due to the concentrated tincture formula, Acid Free-Flux Drops are absorbed into the stomach and digestive system with ease – exactly when you need it! Calc phos D6 is a biochemic tissue salt and a natural component of all fluids in the body. It acts as a nerve nutrient, and is naturally present in all brain cells and nerve tissue. Calc phos is strongly indicated for people who suffer from indigestion, digestive discomfort and heartburn after meals, often resulting in anxiety and insecurity around food and health. Carbo veg 6C is well known for its supportive capacity on digestion, including the discouragement of common gas and wind. Carbo. veg. tends to suit those individuals who prefer clothing loose around the abdomen who also tend to lie down after eating or drinking. This remedy also supports healthy circulation and healthy energy levels. Nat phos D6 is known as the ‘biochemic antacid’, Nat. phos. is widely used to address digestive comfort, especially after meals and is of great benefit for people who tend to suffer from common indigestion and burning. Mag carb 6C - this tissue salt can help support muscular tissue (a lack of magnesium in the body can result in common spasms and cramps). Silicea D6 - this is a cleansing tissue salt often used to help detox and flush out the system. It can also support healthy ph levels in the stomach. Acid Free-Flux contains no gluten, artificial flavours, colours or preservatives. It is suitable for vegetarians and safe for all ages. Acid Free-Flux is presented in a concentrated 50ml tincture formula, making it easy to take. Hold bottle upside down and administer 10 drops directly into the mouth. Alternatively dilute 10 drops in quarter cup water and sip slowly. Dosage may be repeated every 20 - 30 minutes if needed until symptoms subside. May be used with Gastronic Dr. and DigestAssist for ongoing digestive support. Triple Complex Digestion Tonic is a biochemic tissue salt combination in tablet form for cellular support of the stomach and digestive tract. Acid Free-Flux supports the body on a cellular level – helping to support healthy, calm, soothed digestion - from the first dose. Acid Free-Flux contains homeopathic ingredients in a tincture formula that facilitates rapid absorption into the stomach and digestive tract. This means that the healthy functioning of the digestive system is instantly supported. One bottle of Acid Free-Flux will last approximately 30 days (depending on frequency of use). I am so glad I found this website. My husband is always complaining but I think it is from the Taco’s and chili peppers he is always eating! I ordered some Acid Free Flux and wow! It has helped him so much. This past Thanksgiving my family commented on how great he was doing – no complaining! Thank you. I have had ‘heartburn’ recently. I am a student under a lot of strain with work. I start to feel burning and a hot sensation traveling up to my throat from my stomach. Sometimes I even belch! This has been a blessing, I take it every morning after breakfast, and sometimes with lunch and dinner if I need to. Great product, thank you. Safe for pregnancy and all ages to soothe reflux and digestion!